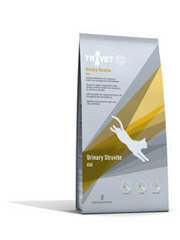 Trovet Urinary Struvite diet (ASD) is a dietary food for cats suffering from Feline Urological Syndrome or stuvite uroliths. It is a complete diet with adjustments in the mineral composition to favour the production of acidic urine and to reduce the urinary concentration of the minerals that are implicated in struvite formation. Trovet Urinary Struvite diet for cats can be fed long-term as it is capable of supporting long-term maintenance of cats in any life-stage.